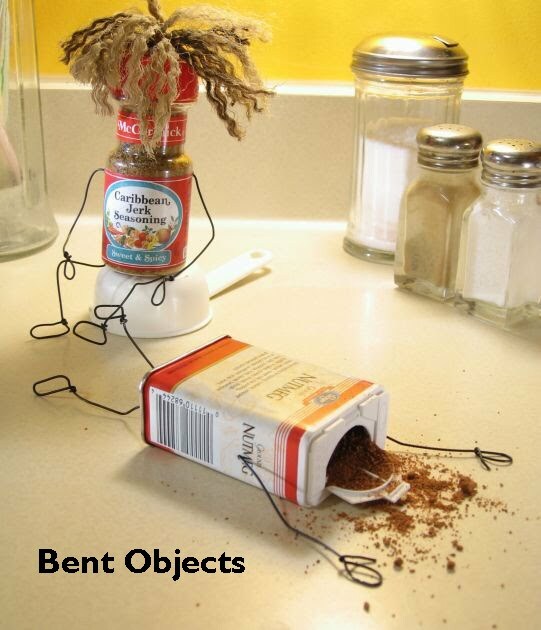 30 Bent Objects Holiday cards go to the best limerick having to do somehow with Thanksgiving. Winner announced and cards mailed Monday. Still plenty of time to order a doodled-in book too! (and I do doodle in them a bit more than the example I photographed). An old photo for now. Photographed with a decent point and shoot on tripod. Lighting- Under cabinet radio/cd player light, plus two flashlights. I was hoping to get a shot done over the weekend. Even had everything ready to go, but it's the first in a very long time that will be photographed outside, and things didn't work out. Instead, here's an oldie that didn't make it into the book, pretty much because I couldn't find the original big file of it. That's never happened before, but no, I'm not the most organized guy you will ever come across. I saw this photo on Reddit.com once, and all the comments were pretty entertaining. One person didn't believe that there was really a seasoning with that name, but I can assure you that there is. 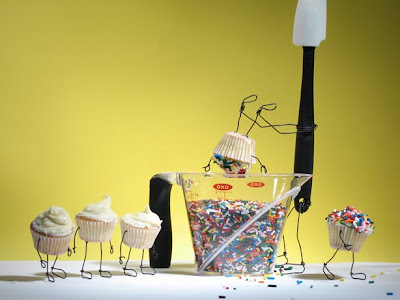 Also- Christoph Niemann is an awesome, creative, son-of-a-gun. More proof here- Leaves. And what's worse than being an athlete who is hurt bad enough to be carried off by stretcher? Being carried off by these guys. 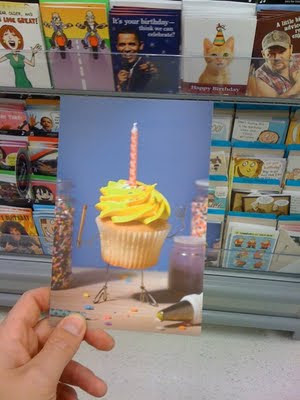 Here's one of the cards available at Target stores now. 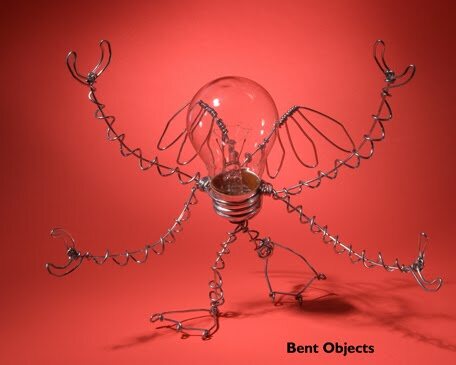 Just a few Bent Object cards now, but there will be 4 or 5 more next year. Some people might think this is too cute, and doesn't have quite the same edge as most of my stuff. That may be true, but remember- she is serving herself up to be eaten as soon as the candle is blown out. Well, I did it. I had some Bent Objects holiday cards printed. I had just a few thousand made, so they will be unique. They were delivered to the house a few days ago, and the printer did a very nice job with them. They're A2 size ( 5.5'' x 4.25''). They're multiple use, because they're blank on the inside, so they can be Thank You cards, Christmas or New Year's party invitations, or Happy Holiday cards. Versatile is good way to describe them, I think. 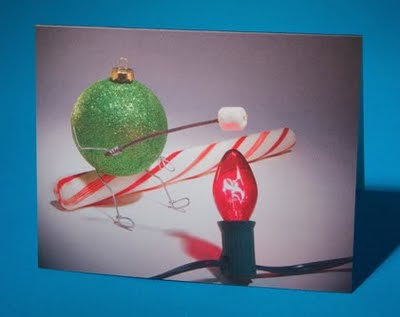 I also like blank cards so I can personalize them a bit with a "Happy Holidays! ", Season's Greetings! ", "Merry Christmas to our good friends ____", or "Happy New Year To _____!" You can have it say whatever you want without trying to think of something extra to write under an already printed saying. That's the trouble I have with cards anyway. Maybe you're more talented in this area. 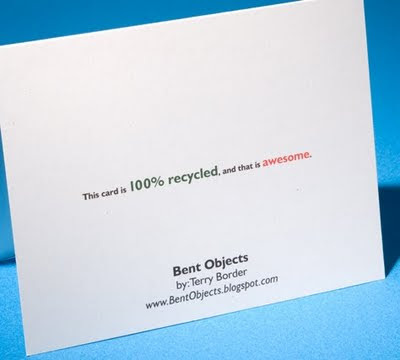 Oh, and did I mention that the cards are 100% recycled? Yep. And the envelopes? Also 100% recycled. Try finding that in the big box store down the street. You can pay using the donate button on the sidebar (there is a section there at Paypal for you to leave info for me). If you have any questions, email me at BentObjects@gmail.com. edit- Yes, I know there will be some peeps out there asking for Hanukkah cards ( and I have that one photo from last year), but I shot my budget on this one.